The Library will be celebrating all things RESEARCH! Shut up & Write, Make your Research stand out! & Who’s citing Who? Along with this, we are going to be promoting resources and guides that can help you get ahead with your research & sharing interviews, tips & advice from those who have survived the highs & lows of researching to tell the tale! If there is anything that you’d like us to cover- please don’t hesitate to get in touch via e-mail, twitter or facebook! 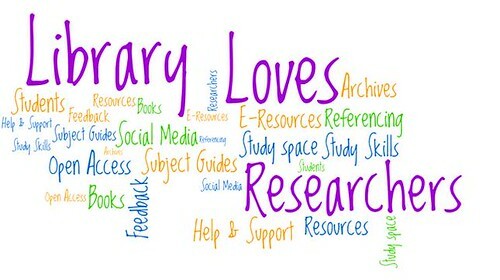 Calling all RHUL postgraduates: the Library Loves … YOU! Room 2.03, Bedford Library, every Thursday in July from 14.00 to 16.00, starting this Thursday, 11th July. or any other questions you might have regarding library services, no matter how basic or complex! So, please do come along and feel free to contact the Information Consultant for your subject area / Department (this will link to the list of subject specialists) beforehand and we will be able to have some material ready for you, or just drop in if you happen to be in the area! If you cannot make any of the drop in session, you can always arrange a one to one appointment with the Information Consultant for your subject area / Department . We hope to see you on Thursdays in July! Plan your search strategy at the start and you will be able to find lots of relevant resources which will save you time in the long run. What exactly is the topic you are searching for? What are the main concepts or keywords for your topic? Are there any similar words that describe each of these concepts? How might you combine these keywords together to search? Use tricks like Wildcards and Truncation to search effectively. There is more information on this here. Look at the Cited by and Cited references for what you have found – save time by using the references in good research to find more good research. There is lots of help in the Library Space on Moodle about this. You have mastered your search techniques but you now you need to think whether your results are good enough. This presentation will give you some guidance in how to evaluate information. You have access to all the eresources provided by Senate House Library along with those provide by RHUL. You need to register but this is easy to do and instructions are here. You can search through their websites or you can connect to Senate House through Google Scholar. There is more information on this in this post. The library is your best friend at dissertation time. You can come in or use our virtual enquiry services to ask questions. Keep an eye on the Blog and Moodle for new training being offered. But most importantly use the Library Subject pages to find out which resources are best for your subject. Use tools like Evernote and Dropbox to organise your notes. Did you know that you can link Google Scholar to the library here at Royal Holloway and also Senate House? It’s a really useful thing to do as it means when you search for things you can check both collections. Login with or create a Google Account if you don’t already have one. From the Google Scholar home page click on Settings in top right hand corner. If you are on campus Royal Holloway will automatically appear, along with Open WorldCat. Off campus you may need to search for Royal Holloway (if you log in and save this you will only need to search once). Check both boxes next to Senate House Libraries – Available at Senate House and University of London Senate House – Full Text @ My Library. You will need to register to use Senate House resources. There is more information on Senate House in this post. Now when you search using Google Scholar you will be able to see if the article is available through Royal Holloway library or Senate House. Have you used the British Library? If you haven’t but are interested in going there and (to quote them) exploring the world’s knowledge these videos will give you tips before you go (so it is a little less scary). It is a great resource for researchers, staff and dissertation students. There are a few rules about using them so this is a great video so you know what to do before you go. Even if you don’t want to use it I’d recommend visiting the permanent Treasures of the British Library exhibition (see Jane Austen’s writing desk, The Magna Carta and Gutenberg Bible or any of their temporary ones. Journal Citation Reports via Web of Knowledge. Publish or perish: uses Google Scholar data: http://www.harzing.com/pop.htm. Download the application from the website – you should be able to install it on your PC. It uses data from Google Scholar, so it picks up titles not included in JCR, such as reports and other non peer-reviewed materials. The results are therefore widely different from JCR and should not be directly compared. Google Scholar Citation Service: http://scholar.google.com/citations. Data is still being developed as this service is quite new. It’s more about the number of author citations than about journal impact factors. Takes data directly from JCR, but doesn’t usually include the most recent report data.